Throughout this camp week, beginning with the basics of kitchen safety, your camper will participate in hands-on culinary classes in the College’s kitchens–all while using real recipes easy enough to duplicate with the family at home. We also cover nutrition, ingredient information, and food safety! The Young Chefs: International Cuisine Culinary Camp covers the cuisines of: China, Germany, Italy, Jamaica, and more! Tuition price does not include a tool kit. You can purchase a tool kit by selecting the kit option at the bottom of this product before adding to your cart. Campers are required to bring their tools to each day of camp. These tool kits can also be created out of items from your home kitchen. Click here to see which tools are required for camp. --Have you already registered for camp and forgot to select the tool kit option at checkout? -->You can purchase a tool kit anytime online and it will be ready in the kitchen for your camper on the first day of camp. Not sure which size chef coat to order? 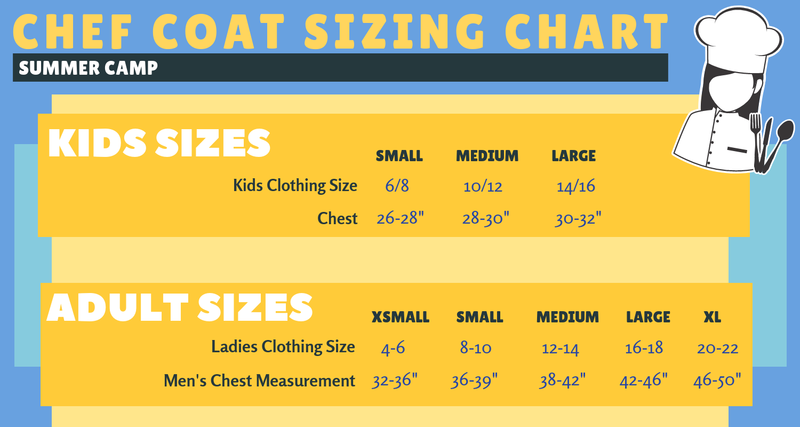 Check out the sizing chart below. Typically, Young Chefs between the ages of 11-14 will fit better in adult sized coats. All summer camps are held in the kitchens of the historic Allison Mansion at 4207 Walnut Street, Philadelphia, PA 19104. During drop off and pick up, guardians are welcome to utilize our FREE gated parking lot directly off of Walnut Street between 42nd and 43rd Streets. While supplies last, we are offering a $25 REBATE off your total camp purchase when you register your child for two or more weeks of camp. Not valid to combine with any other offers, coupons, or discounts. Click here to read our Summer Camp Terms & Conditions! Click here to read our FAQs!